These are like delicious mini carrot cakes, without the bother of nuts and raisins. Just that yummy carrot-spice flavor with, of course, the cream cheese filling. Great for breakfast or when any sweet-treat craving hits, the muffins are hearty, yet light and fluffy at the same time. They also aren't overly sweet, which can be the bane of many a carrot cake. The cream cheese filling part of the recipe was definitely too much and could have been halved...yet how do you halve one egg (I guess egg substitute would be the answer)? 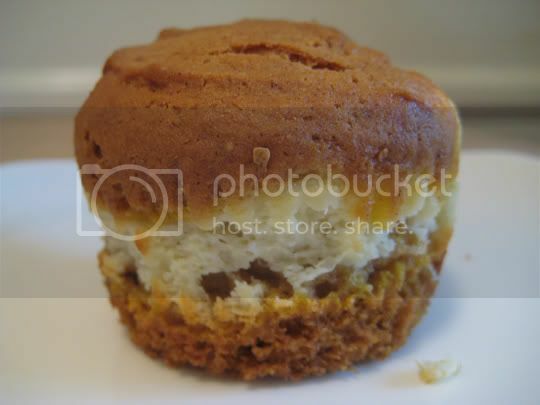 The filling was also too soupy to really be the "center" of the muffins, so it came out as more of a cream cheese swirl or layer. Which was fine, they still tasted amazing! Make again? Definitely. Maybe I will double the batter recipe next time to make up for the extra filling.